Inducted 2012. Member of Five Championship Teams and Six Other Teams that Qualified for State and National Tournaments During her High School and College Careers. You won’t find Jill (Vogel) Wellman’s name on the lists for individual softball and volleyball records at Quincy Notre Dame, but it was more than coincidence that she was a member of five championship teams and six other teams that qualified for state and national tournaments during her high school and college careers. Wellman, a 1984 graduate, was a four-year starter and a defensive standout at third base on the QND softball teams that won state championships in 1981, 1982 and 1984 and took third in 1983. 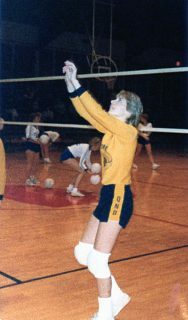 She was a three-year starter as the setter on the volleyball teams that placed third in 1982 and second in 1983. She was the most valuable player on the 1983 team. 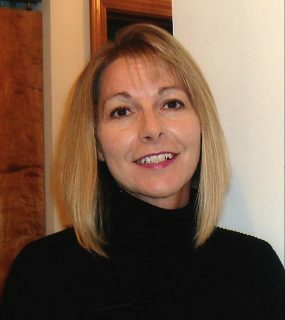 At Quincy College, Wellman was a four-year starter on the volleyball team, helping the Hawkettes qualify for back-to-back NAIA national tournaments in 1984 and 1985. She also was a member of the 1984 softball team that placed second in the NAIA national tournament. After QC lost its standout senior pitcher, Wellman was asked to share pitching duties as a sophomore despite having never pitched regularly, even in high school. She helped theHawkettes win the 1985 NAIA national championship. Wellman went on to post a 42-36 career record as a pitcher with a 1.15 earned run average and 20 shutouts. She still ranks fifth in career wins, fourth in career ERA and fourth in career shutouts. Wellman and her husband, Andy, live in St. Charles, Ill., where she is the co-owner of a running store. They have two children, Nicholas and Brooke.